We are BIG coffee drinkers here at StoneGable! 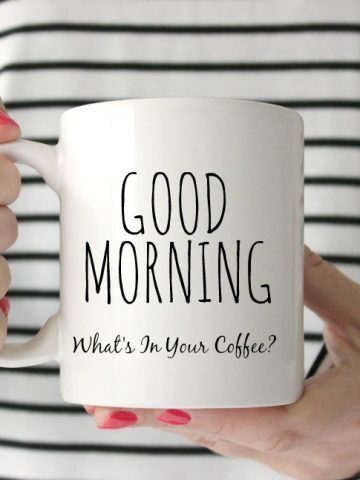 Mornings start with a mug of S-T-R-0-N-G coffee! 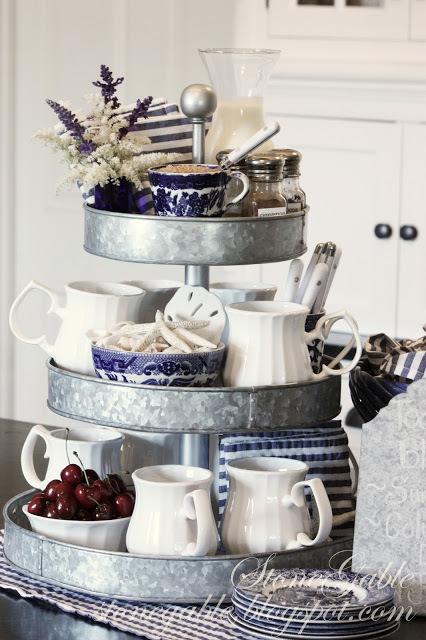 I found this great triple tiered galvanized metal caddy at the Pottery Barn Outlet. It works great as a coffee station. Getting all the mugs and coffee related paraphernalia up and vertical is quite a space saver. The coffee bar is stationed on one side the kitchen island, away from where I cook breakfast. That way I won’t be shoo-ing people out of my cooking space! And a little bowl of cherries! I know that my boys will not be able to hold out till breakfast without a little nosh! Striped napkins (Sur La Table) look summery and fresh tucked in here and there. These are great NO iron napkins! Perfect to use and reuse all season long! The top tier holds all yummy things to make a strong cup of Joe even taste better. An old flea market cup holds raw sugar. 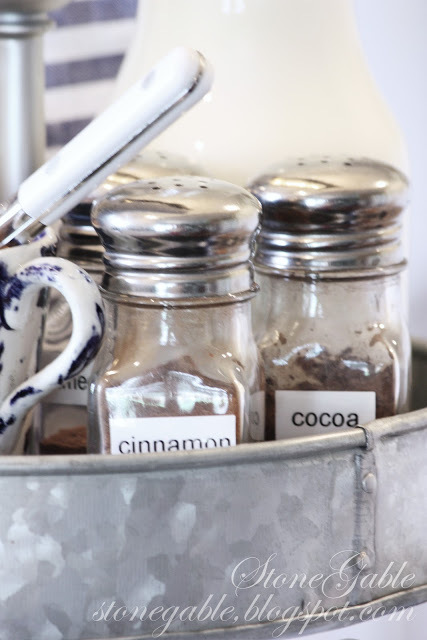 Salt shakers hold cinnamon, nutmeg and cocoa. The shakers were labeled with one of my favorite gadgets, my label maker. I could seriously get a little crazy with this wonderful fun machine! Milk mixed with a little cream is in an easy to pour glass bottle. 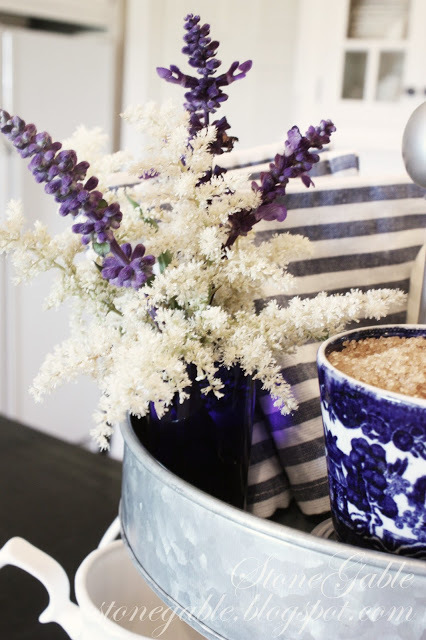 White astilbe and purple salvia make a frilly little bouquet in a cobalt blue vase. 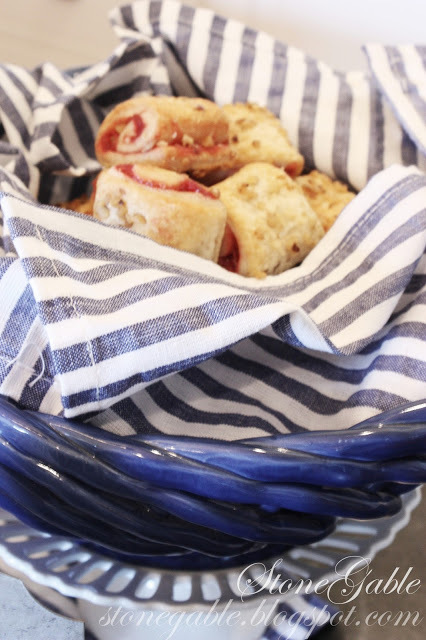 A blue woven basket (Wm-Sonoma) of sweets helps get rid of any morning hunger until breakfast is served! Remember to save this to your Pinterest COFFEE or SUMMER or TIPS board. You can follow me on Pinterest and see all the great things I’m pinning HERE. I love this idea for when friends and family are visiting!! Very pretty. I did something similar to this. Enjoy your ideas. I ran across your blog, and now have become a “follower”. You have some very inspiring ideas. It is very kind of you to share your wonderful ideas with everyone. I love this coffee station idea. I recently went to a chocolate and coffee festival here in Albuquerque. I ran across this very strong coffee called “Death Wish”. It doesn’t have that acid after taste. Thanks again, and I look forward to more post! THANKS Audrey! Death Wish sound divine! I love it! you are so creative!! I enjoy your blog so much! I have a coffee station on a built -in desk that I never used. I was glad to see your post today. I need to add to mine and I got some new ideas. I can’t wait to open your e-mail every morning. I love your coffee bar, working on something like ithat for my kitchen thanks for the inspiration. Wow…WOW…WOWZERS…I am ordering my tray online now. LOVE IT! Mmmmmm…..morning coffee. Nothing better, IMO! Thanks for the inspiration! This is absolutely gorgeous!! I don’t actually drink coffee but I still need one!! Like. 🙂 Enjoying my morning coffee this quiet morning except of coure for the road crew milling our street outside my window. Of course it was the first morning in awhile cool enough to sit on the porch. Skipping that today. Have a good one! I have wanted a galvanized stand like this for awhile but didn’t really have a purpose for it! I do now! LOVE this! Well, Yvonne this is beyond fabulous! We are big coffee drinkers here, but I’m going to have to “fancy” it up a bit now, lol. Just discovered your blog through Pinterest. Just beautiful!! Gracious living at its best. This is just too sinkin’ cute! I love it! 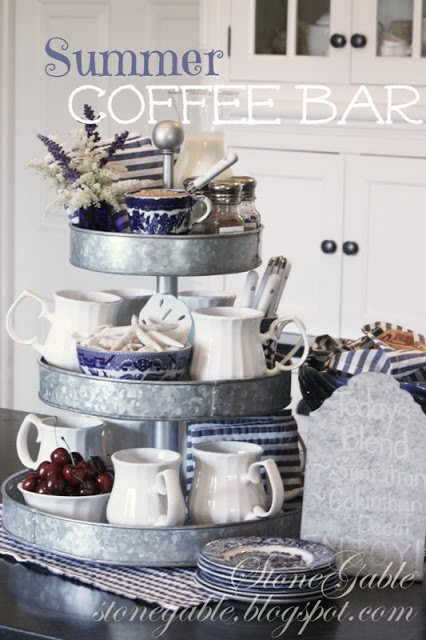 Love your coffee bar oh and the blue and white!!!! Perfect for guests! Can’t wait to shop for one of these. What a great and wonderful idea! Delightful way to start the morning. Hello Yvonne!, we are strong coffee drinkers, too! The tiered tray is just wonderful for this purpose. Your whole kitchen looks terrific! You come up with the best ideas. I just love your coffee bar! Creations by Cindy highlighted your post on her blog. What a cute idea! I love the cinnamon, nutmeg & cocoa. I also thought the sugar in the tea cup was a pretty touch! Cute, cute presentation!! Your blog and ideas here always amaze me! Thank you so much for sharing your creativity here! Happy Friday to you…now off to have coffee with the girl friends. 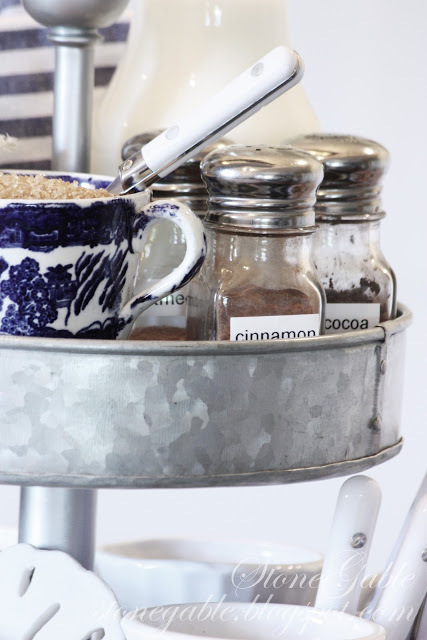 I love this galvanized tiered holder…I wanted one the first time I saw it in a pottery barn catalog! Such a cute idea for coffee….I don’t drink coffee but I would love to do this foe hot chocolate …it would be so cute! Thanks for stopping by and linking up to Centerrpiece Wednesday! You always share such fabulous ideas and photos! This is so beautifully simple and lovely. Please invite me to your house for coffee! I don’t even drink coffee, but I’m going to try to copy this! Love all your cups and decor on the tray. love, love, love! Great idea with the coffee station. 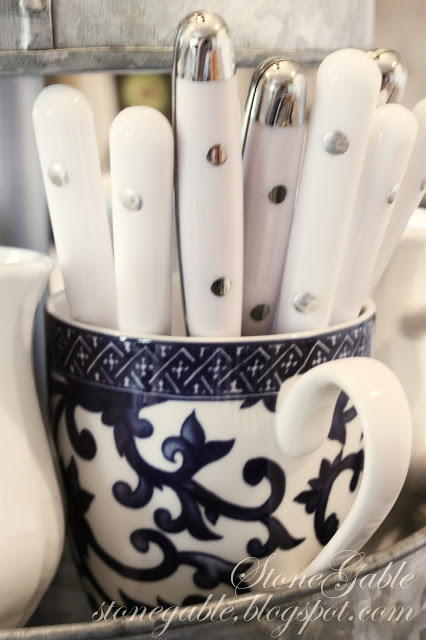 Your guests can make themselves at home without bothering you. Looks like you have thought of everything. I say NO to Starbucks…..you get more personalized service at your house. This is so cute! I’m not even a coffee drinker but this makes me want to be. So you found this at the PB Outlet, I’ll be on the look out, love this idea. 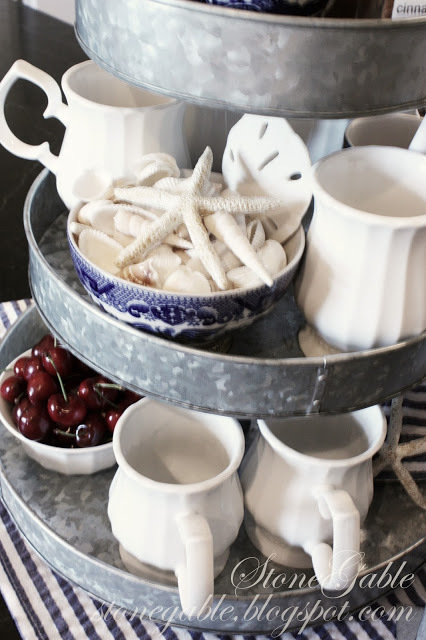 I so love your tiered tray, what a fantastic idea.. Thanks so much for sharing, and no; not everyone needs Starbucks!! This is simply amazing! You have done an incredible job in re-purposing the tiered server! Love all the blue and white, along with the shells. Your photographs look like pictures in a magazine – wow!! I love, love, love this idea for a coffee bar! It’s so much more fun than how I just organize everything in a corner. I’m going to try something like this for our next brunch. Loving your blog! That looks so summery and inviting with the blue and white. Gorgeous, Yvonne. I love the tiered piece. Oh what fun. 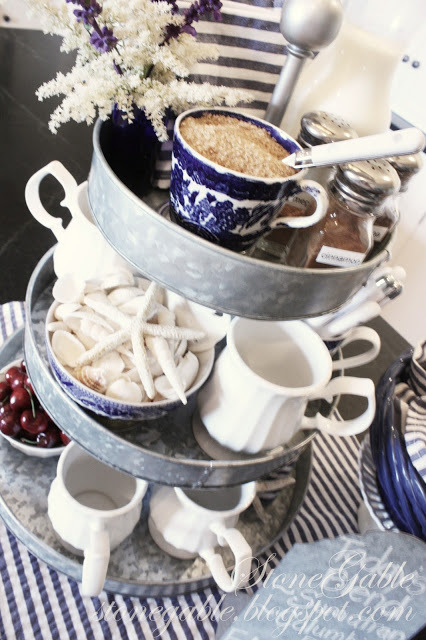 Love this idea and that tiered tray!! 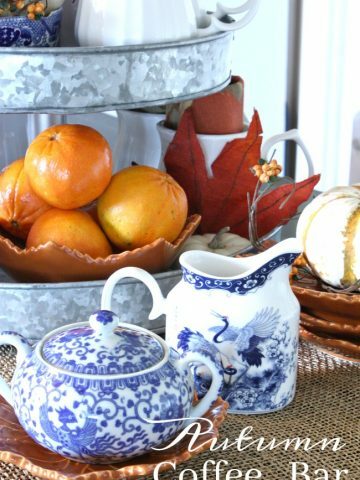 Yvonne~ What a perfect use for your PB tiered tray! We don’t have a PB outlet nearby but I remember seeing that piece in the store! 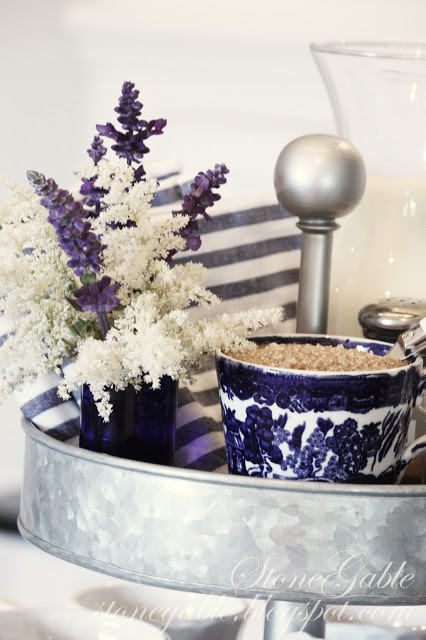 Serving coffee never looked so good with your mix of blue, white, flowers & shells! Exceptional use of that tiered tray!!! I have seen that at Pottery Barn and loved it! You came up with a really unique way to use it that makes a whole lot of good sense and frees up a lot of horizontal space on the kitchen counter! Although I am not a coffee drinker I think this is a great idea when we have guests. Thanks you for the inspiration! LOVE this…will have to reproduce it the next time I have company. I have a label maker problem too! So does my daughter…guess it is hereditary. 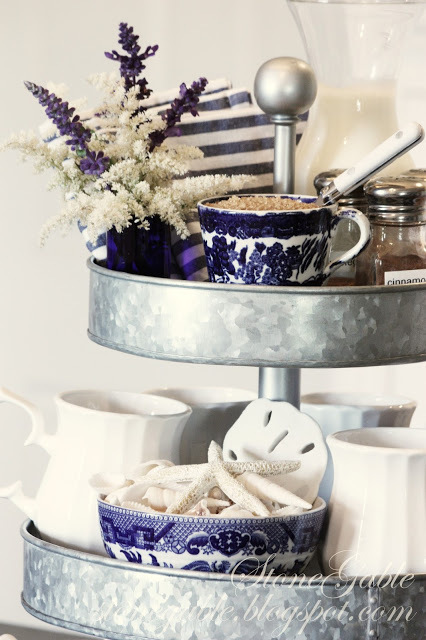 I love that tiered tray! I have been watching at Pottery Barn hoping they may put it on sale! I love how you made use of it. Thanks for sharing! How welcoming! Your guests must have been so happy to feel so pampered! Yvonne I am drinking my quite strong morning coffee as I read your wonderful post!! 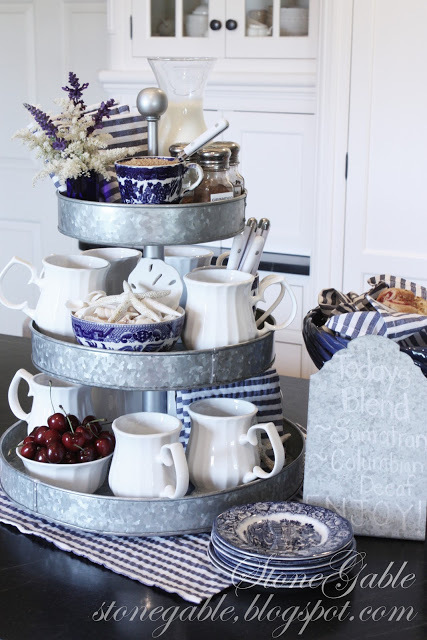 A great Coffee Station I love the tiered tray and the stripe napkins! This is great, Yvonne. I look forward to the weekends so I can enjoy a leisurely morning cup of coffee at home. I usually wait during the work week to grab a cup when I get to the office. I love your coffee bar. We drink a lot of coffee here. Right now we are drinking ice coffee. Great idea. It all looks so inviting and so well executed! PS I bookmarked this to show my daughter! Ok, I think I need to start following you! What a great idea for a coffee bar. Everything is so compact yet pretty. Oh my Yvonne….what a fantastic idea….and it keeps thinks in such a gorgeous display….You are the creative one! !….I am crazy in love with that Idea…it’s beautiful!! Love your coffee station. What a lucky family you have. You are a real homemaker. Beautiful and space saving, too! You have such a knack for making the everyday elegant. 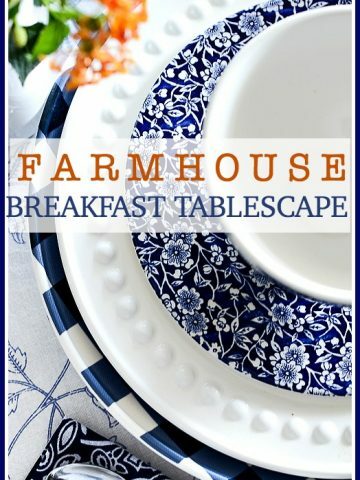 This is a great idea Yvonne and I love all the blue and white against the galvanized iron! I’ve had my eye on that stand for awhile and now that you’ve given me another way to use it, I may have to get it now! What a great idea. Styled so pretty as you always do. I don’t have one of these stands but I sure wish I did. 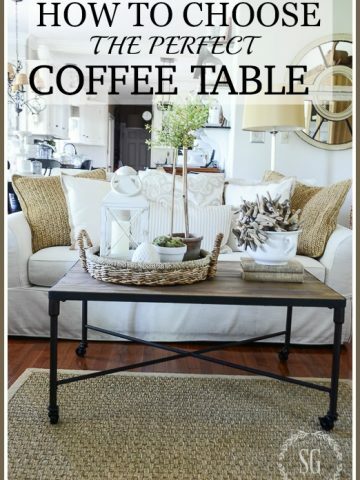 This works so well for so many things and you turned it into a very stylish coffee bar. Beauty and function-winning combination! Ohhhh I love the galvanized tiered stand! I’m not into coffee, but now tea, that’s another thing!! Great idea and space saver, Yvonne!! how sweet is that! I love it! 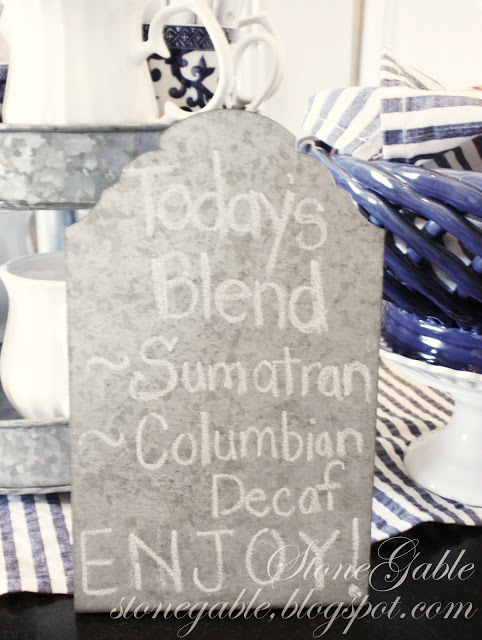 Your coffee bar is such a great idea. It’s not only functional, it’s so pretty. Makes me want to drop in for breakfast! What a great ideal and I love that tray. You covered everything and I think any guest would feel right at home. Now you’ve done it! Made me want one! You did a great job setting it up. Beautiful! We love our coffee also and your wonderful coffee bar is a terrific way to gather everything in one spot! Love it!! I absolutely love this coffee bar! The blue and white is so refreshing. The triple tiered tin stand is a beauty as are the lovelies with which you have filled it. 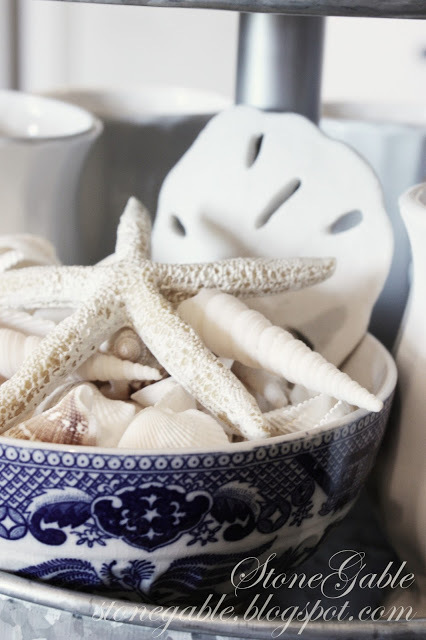 The bowl filled with seashells just sings of summer. Such eye candy! I ran over to tell you the Pool Noodle party is open for a week, plenty of time to come play! A great coffee station, Yvonne. I like to do this in the winter with a collection of hot drinks. Hot chocolate, cider mix, tea and coffee. It’s so fun! Yours looks beautiful with all the lovely blue and white!! I was just admiring the galvanized tiered tray filled with blue and red flowers in the PB catty that came in the mail today. What a great idea to use it for your coffee station! Columbian coffee and a sweet would be breakfast enough for me, dear friend!!! Wonderful idea! I’ve set up a similar drink station during the winter months for hot cocoa…now you’ve got me thinking!!! Always inspiring ideas @ StoneGable!!! What a brilliant idea:) I just love it, and all your cute ideas for coffee. I now think I need a trip to PB. I just love everything about this Yvonne! I’m dying for a cup of Joe right now!! I love your little coffee station. 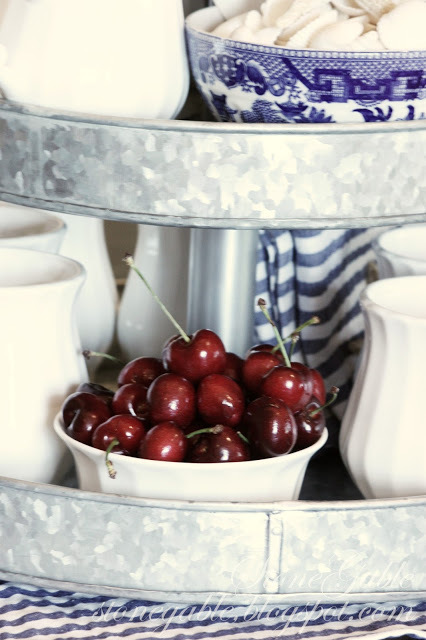 I also love that galvanized tiered tray. Would love to find one for myself. It sure looks like morning time is fun around your place! I LOVE that galvanized metal tray. And what a great coffee set up you’ve created. I don’t drink coffee, but this would work with tea, too. Just wonderful! The galvanized tray is to die for! You have set up the perfect coffee bar to make anyone and everyone welcome! What a great idea Yvonne! Everything you do always looks so pretty!! That’s a wonderful set-up, Yvonne! I love mixing cocoa and coffee for a mid-afternoon pick-me-up. Love the napkins and your white handled silverware. Everything looks so pretty and organized! I really like your coffee bar. My husband and I are also coffee lovers. Clever idea! What a fabulous idea!! I never thought to put cinnamon, nutmeg and cocoa in salt shakers. We love our coffee in the morning. 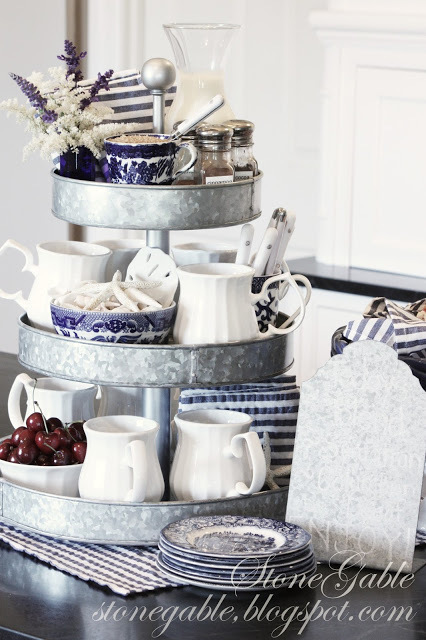 We use 5%cream.Love the blue and white napkins.What a great use for a three tiered tray. What a great use for that tray! I have the same one from Pottery Barn. Now I will need to dig it out and bring it back to life! Love your coffee bar! So pretty and neat, what a great way to start a morning! I will do this the next time we have guests!!! My day starts with a strong cup too! !